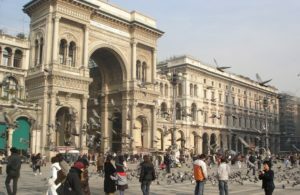 Having decided that, in order to make the most of my new Milan locale, I need to learn Italian and quickly, I set about the business of finding a suitable course. I turn to my new bible, Easy Milano, the magazine for English speakers in Milan. Among its pages of useful information are lists of Italian language schools – hundreds of them. How to choose? Scanning the list I spot Societa Dante Alligieri, courses in Italian for foreigners. I know the Societa Dante Alligieri! Once, an historic age ago, as a student teacher, I performed with my Introduction to Italian class at the Societa Dante Alligieri, in Christchurch, New Zealand. The title of the song we sang – La Bella Polenta – remains with me still. The words and the tune, alas, are lost, along with most of the language I learned in my “Introduction to Italian”. Throwing on my coat, I head out to the Societa Dante Alligieri to enrol. I sign up for A1, the beginner’s course, which is where students with only basic greetings and a few random phrases belong. But Maria Grazia, who handles my enrolment, assures me that after a month of daily A1 three hour total immersion classes, I’ll be set for everyday life in Milan. I start the next morning. The course is brilliant – two hours of written language with Patrizia and one hour of conversation with Myrta. Both are great teachers – fun and interesting. My classmates are fascinating. There’s a student chef from Korea, a Frenchman working in Milan’s textile industry, a young woman from China studying fashion, a model from Belorus and a Russian lawyer, learning Italian before beginning work. The course moves swiftly and after a week, my language has increased fifty fold and most importantly, my confidence has doubled.